We’ve talked about Insteon Scenes in the context of the ISY-994i and the MobiLinc software, but now let’s look into what they are and what they can do in more detail. At its core, a scene is simply a collection of devices, the states associated with it (such as on/off or dim level), and how to get there (called “ramp rate” – you can do a slow dim of the overhead lights while instantly turning on the curio cabinet lights, for example). The always-helpful Universal Devices wiki has an informative page on scenes where you can learn how to create them. The example given on that page is the creation of a “movie scene”, where with one button press you can change the dim levels of multiple devices (such as lights) at one time. There’s also a possibility that you may create a “home” scene to turn on multiple lights at once when you come home at night, and turn them all off when you leave – or you could even create a separate “away” scene that turns off all the lights, but leaves the front porch light on at 100% brightness and the back porch at 75%. What are scenes “normally” used for? I’ve seen a high-end Crestron home that has LOTS of lights also have lots of reasonably complex scenes, where one button can turn on the hallway and the living room lights, for example. But in smaller and particularly retrofitted houses where you’ve installed Insteon after construction, scenes typically take on a different purpose. Why? Two reasons: first, in more modest homes you aren’t likely to have 14 different sets of lights in one location (such as a kitchen having a separate circuit for the can lights, overhead pendant lights, in-cabinet lights, under-cabinet lights, over-cabinet lights, etc.). Second, since the house was built with traditional switches it’s likely that various “paths” were already thought of in advance with the existing wiring. For example, the Crestron home I’ve seen had a very large second-floor hallway and landing area which had two separate circuits for each half of the hallway. A scene was used to turn on both halves at once, but technically they could be operated independently with different switches. With a more modest home you’d likely just have a single circuit powering the entire hallway anyway, so there’d be no need to create a scene to control both sets of lights at once. Why do you need to use scenes? So does that mean we don’t need to worry about scenes? No, it just means that you likely won’t be using scenes in the way that you usually read about (controlling multiple lights at once to create an actual “scene”). Instead, you’ll be using scenes to control multiple switches at once. In other words, while you often won’t need a single switch to control multiple lights, it’s much more likely that you’ll control a single light with multiple switches. Your house will have 2-way and 3-way switches all over the place (such as a light switch on each end of a hallway, or one at each of the 3 entrances to your living room). As we discussed in the past, with Insteon, there is no longer a one-to-one relationship between switches and the lights they operate. So while one switch will carry the “load”, actually connecting the power from the street to the lights themselves, the others in these multi-way switches will simply communicate with that load-bearing switch the respective commands such as on, off, or dim. For this you’ll use scenes, which are basically a level of abstraction that you should understand. Instead of thinking about the switch at one end of a hallway communicating with the switch at the other end to turn the lights on, you should think of either switch telling the “system” to turn a “scene” on and off, and the other switch simply responding to the state of that scene. The key thing to understand here is that in the context of Insteon there are devices and there are scenes. Each device can be a controller, a responder, or both. 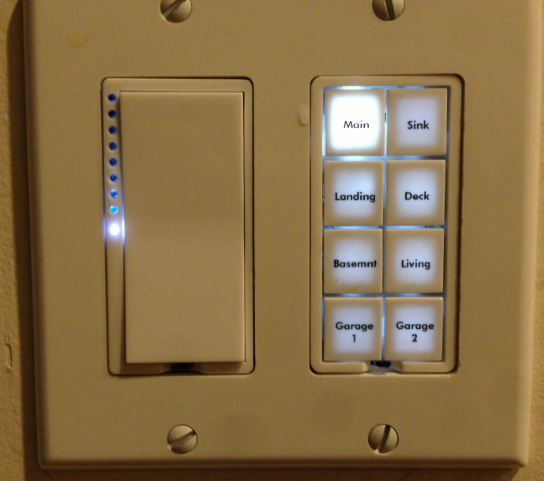 Insteon switches are both because they not only control things by sending signals, they also respond to things by illuminating the LEDs on the switch itself to show their status. Motion Sensors on only controllers because they don’t receive any commands, and the Insteon 8-watt light bulb is only a responder because it doesn’t actually offer any “inputs” like a switch does, so it can’t control anything. We briefly touched on 2- and 3-way switches, but as you’re rewiring your house, you’re likely going to use an Insteon 6-Button Keypad or Insteon 8-Button Keypad as well, which means that a single device on the wall may be a controller and a responder to up to 8 scenes – but in the case of the keypads, only one of them (the upper-left) actually controls load of a connected device. You create scenes (identified in the ISY-994i with the icon) so that when you click the “on” button on one switch, the status of all the others – whether they are controlling the load or not – also indicate their state with those LEDs on the switch. For example, the “basement” button in the above picture will light up when the basement light is on, regardless of whether I actually used that button to turn it on. It’s simply a responder to the scene. Because I can physically press the button to toggle the state of the scene (thus turning the lights on and off), though, it’s also a controller. 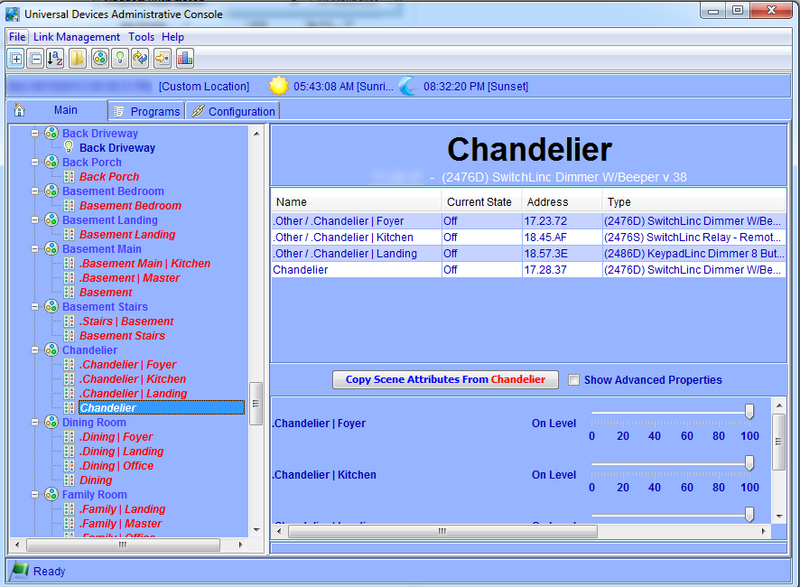 Below you’ll see a screen shot of some scenes; note how most devices are both controllers and responders (red), but the “Back Driveway” light is only a responder to the scene. In fact, this scene doesn’t have any controllers at all, but that doesn’t mean it can’t be turned on and off – in fact, we’ve already seen how to turn that scene on and off programmatically, and it can also be turned on and off through MobiLinc. In the Insteon world, there is a difference between a device (the switch itself) and a scene (an abstract container of multiple devices). 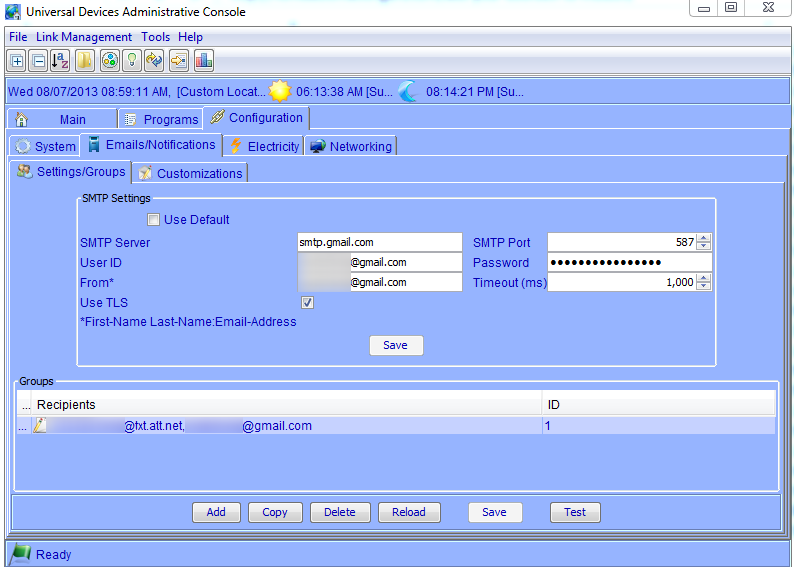 You use scenes to tell all devices/switches to change their state when one of the controllers is activated. In smaller homes, it’s more common to use a scene that contains multiple devices (switches) than to use a single switch to control multiple lights. Even if you only have one device in a scene, it’s still worth creating the scene so that when you use an application like MobiLinc you can see all your lights on one screen.